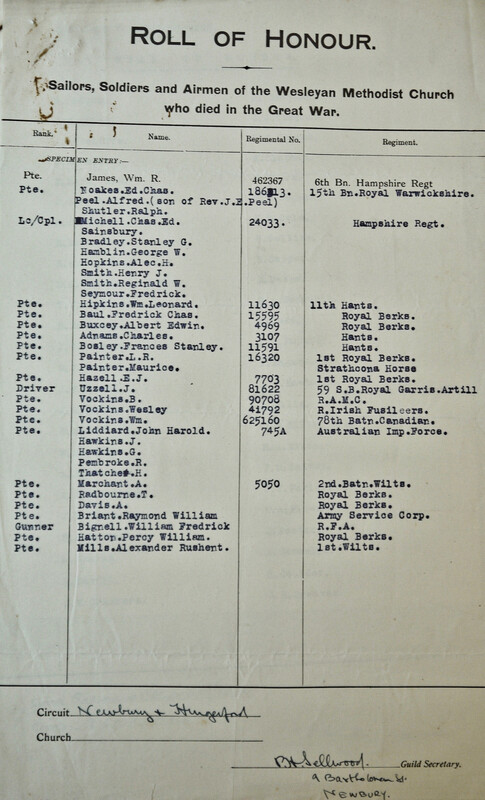 The list shown is for the Newbury and Hungerford Circuit, and was submitted by the Circuit Wesley Guild Secretary P.H. Sellwood. 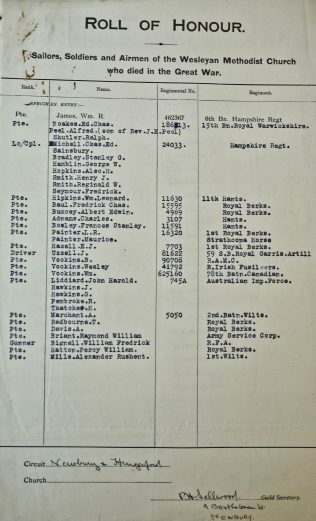 The way the information has been laid out, combined by reference to the Commonwealth War Graves Commission database of the war dead and the Imperial War Museum’s Register of War memorials, has allowed a reconstruction of a more specific list to be drawn up. There is a memorial to the four who died 1914-1917 in the church. These men are remembered on the village war memorial in Kingsclere. These men are remembered on the village war memorial in Beedon, Berkshire. These men are remembered on the village war memorial in Brightwalton, Berkshire. Three sons of William Vokins are on the roll, misnamed. and also remembered on their father’s gravestone in Holy Cross churchyard, Ramsbury. Private William Macarthur Vokins, 625160 78th Bn. Canadian Infantry died 30 Oct 1917 aged 29. He had emigrated to Saskatchewan, and enlisted there. These men are remembered on the village war memorial in Shalbourne, Wiltshire.